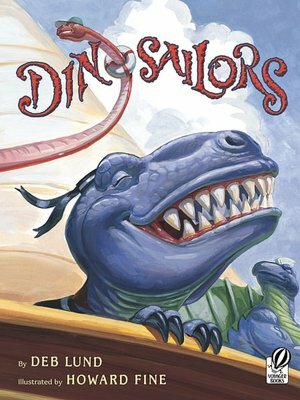 Author Deb Lund and artist Howard Fine's Dino-Series builds on itself, so I really need to start at the beginning of the adventure before I discuss the newest book, Dinosoaring. When my kids were first graders, they each got to take the "Transportation Field Trip" where they took a school bus into the city then rode the trolley, the ferry and a few other things. The books in the Dino-Series (the first two of which are in paperback - a rarity for picture books these days, so you really should snap them up) take me back to those times, especially since the dinos in Lund and Fine's books have the same sense of excitement and glee as my kids did as they boarded the bus to begin their field trip. When you think about how much little kids are fascinated by dinosaurs, combining them with their other passions (trucks, trains, pirates) is just sheer brilliance. In the Dino-Series, each of which begins with portraits, names and jobs of each (Co-Pilot - Hadrosaurus), an exuberant bunch of dinos get the itch to roam. In the first book, Dinosailors, they board a ship with, naturally, some pretty funny results. 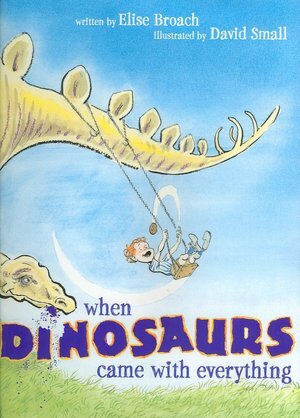 Lund tells her story in wonderful, well paced rhyme, turning the word "dino" into a suffix for just about everything. I thought that this might get old, but honestly, it makes the books more fun, the rhymes more musical and the antics of the dinosaurs all the more entertaining. Dinosailors ends with these lines, "No more seasick dinobunch/ They find a way to keep their lunch./ In harmony they join the chord/ Dinotrains, all aboard!" From sea to land, All Aboard the Dinotrain winds its way through the canyons of the Southwest and even jumps a ravine when the bridge is out. The expressions on the dino's faces as they fly through the air is wonderful. I had no idea those giant lizards could be so expressive, but Fine manages to find a way to show a wide range of emotions on those scaly creatures. All Aboard the Dinotrain ends with the line, "We'll never take another train/ But how about a dinoplane?" And Dinosoaring is ready for take off. 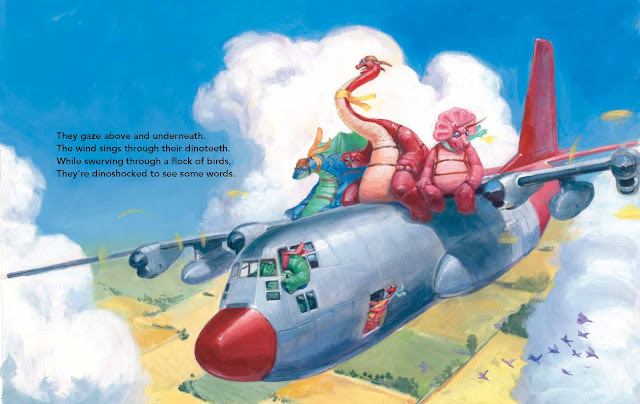 After a running start and some pushing, the dinobunch takes to the air with their dinogoggles and scarves. When the notice some skywriting advertising an air show, they can't resist. A few flyovers and some trapeze tricks wow the audience, causing the dinos to exclaim, "We're like the dinobrothers Wright!" However, an upset tummy never seems too far away from this crew. A few loop-de-loops later, they "dinojump without remorse." Grateful to be back on terra firma, they "kiss the ground, give dinothanks." Happy to be home, the dinos decide to "try out sports and learn to cook,/ Play dinogames and read a book./ But soon they're restless, so perplexed./ They dinowonder . . ." The final page of the book finds the dinobunch out in the country, in a field with cows, leaning out over the fence to peer down the long stretch of road that whips around them and the words, "What comes next?" While dinosaurs seem to be a staple in the world of picture books, there really aren't as many fantastic dinosaur books as you would imagine. Those that are the best seem to play with the juxtaposition of ideas. These story book dinosaurs are giant beasts in a small world which, when flip-flopped, can pretty much describe toddlers and preschool age children - little beasts in a big world. Perhaps that is part of the appeal. That is certainly what works in the How Do Dinosaurs? series of picture and board books with wonderfully vivid and expressive illustrations by Mark Teague and (sometimes clunky) rhymes by Jane Yolen. These books are set squarely and simply in the world of the preschool age child. 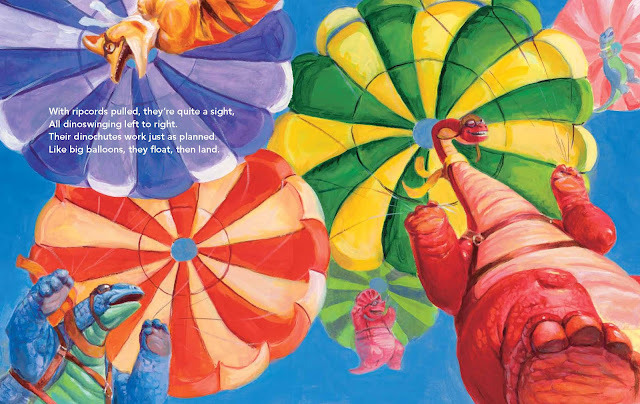 What I love about Deb Lund's books is that she takes these giddy, childlike dinosaurs and sends them on imaginative journeys while also including familiar fascinations from a child's world. 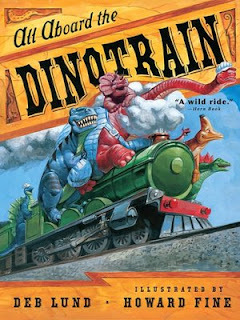 Instead of bedtime, manners, and school, Lund sends her dinos across the high seas, down the rails and into the clouds. Then Howard Fine finishes the job with his painterly, colorful illustrations that combine exciting landscapes (or seascapes) with boisterous but gentle giants for a truly imaginative book series worth owning, keeping and passing on. For readers with a little bit longer attention span, don't miss this fantastic dinosaur book by Elise Broach, with great illustrations by the award winning illustrator David Small, When Dinosaurs Came with Everything. Broach imagines a day when everything from the purchase of a dozen donuts to a shot at the doctor and a haircut gets you a FREE dinosaur. 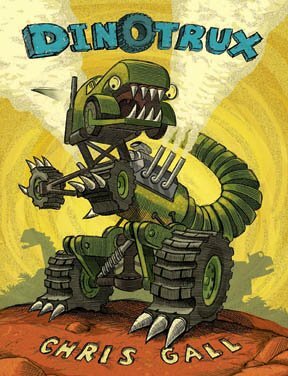 Then, there is the brilliant Dinotrux written and illustrated by Chris Gall in which he imagines a prehistoric world where dinotrux were unruly beasts until the weather changed, many of them rusted and a few shed their claws and cranky ways and became the helpful trucks we know today. 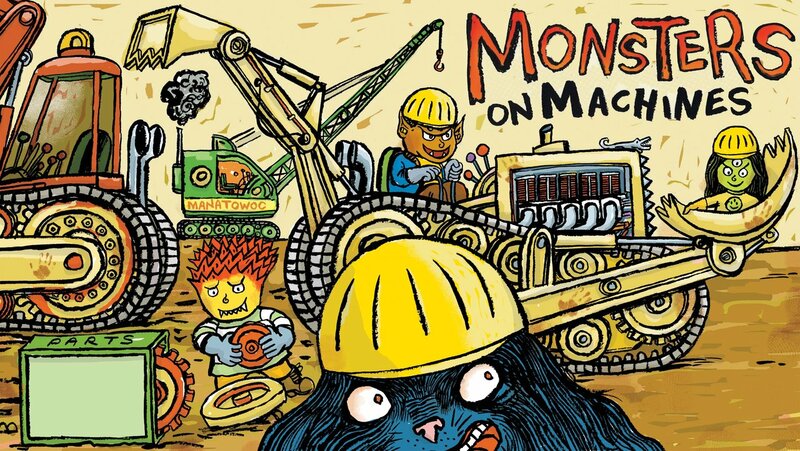 For yet another great book from Deb Lund that combines two disparate things that kids love, be sure to check out Monsters on Machines, illustrated by Robert Neubecker.